In 2018, we launched the first-ever cooperative marketing campaign with Discover Long Island. We also promoted the airport and airlines serving ISP with our Spring campaign highlighting MacArthur Airport’s convenience. In 2017, we began marketing MacArthur Airport with the Fly MacArthur campaign. Our strategy is a team approach between the airport, airlines, the community, AND our passengers. We hope you will partner with us by sharing the message with friends and colleagues. We want to tap into the incredible energy of Long Island! The marketing approach we are unveiling reflects what airlines are telling us: we need to increase demand before they can add more service. Count on us to continue to identify, attract, and incentify new service opportunities. Our primary focus is on increasing passenger demand based on the things ISP does better than our NYC airport competitors. You really will stress less and pay less by flying MacArthur! We base our strategy on industry and consumer research. 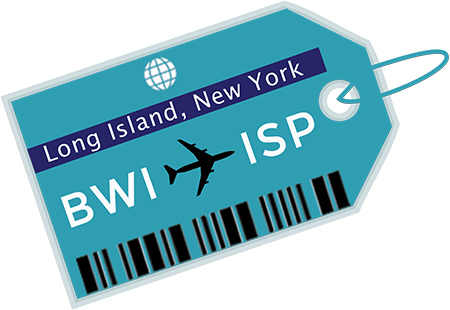 While most survey data on ISP shows passengers know about flights to Florida, the results show we need to grow our awareness of air service to BWI and PHL and beyond. Data also shows that three-days out, ISP flight costs are less to Baltimore and Philadelphia. We believe that is a message we want to communicate. We want to convince community members driving past ISP to make a change and give us a try. Because we’re smaller, we can be more nimble, and alert to opportunities. We can focus on improving the customer experience at ISP. The 6,000-plus people who work at jobs rooted in MacArthur Airport can help us remind travelers to think of ISP first. Businesses can use word-of-mouth to encourage associates to Fly MacArthur. We know our energetic and inspired community will partner with us to support MacArthur Airport, by traveling on flights originating at ISP! This will build a strong case to the airlines that MacArthur is a united community and additional service is a good business decision. In 2018, our Fly MacArthur campaign continues, and look for new information on additional marketing plans!